I’ve just got back from the 34th TESOL Greece Convention in Athens, and I just wanted to say a big thank you to all the people who made it such a fantastic experience – speakers, participants and particularly the volunteers and members of the board, without whom none of it would have been possible. To watch interviews with some of the speakers, click here. I have come away from the convention with many new ideas, and above all a great respect for the dedication and professionalism of the Greek teachers I met. Roll on next year’s convention! 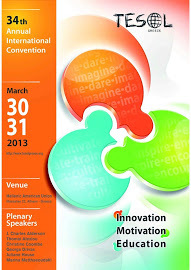 This entry was posted in Conferences, Teachers and tagged 34th National Convention, TESOL Greece. Bookmark the permalink.